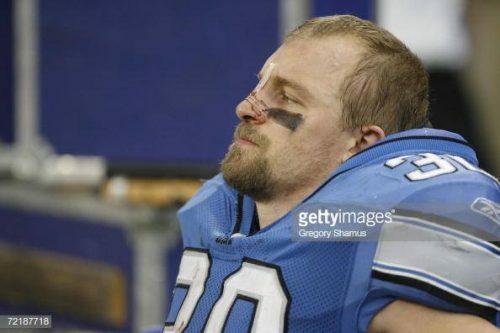 Fullback Cory Schlesinger #30 of the Detroit Lions. Q: What drove you and motivated you in the weight room? CS: I never even dreamt of getting that (Lifter of the Year) award. I guess my teammates saw me differently…they saw how hard I worked in the weight room and how hard I ran in winter conditioning. It was almost like a drug of wanting to improve and get better. And that was the one place to do it, because you could see the progression of getting stronger and getting faster, you just keep wanting more and more of it. 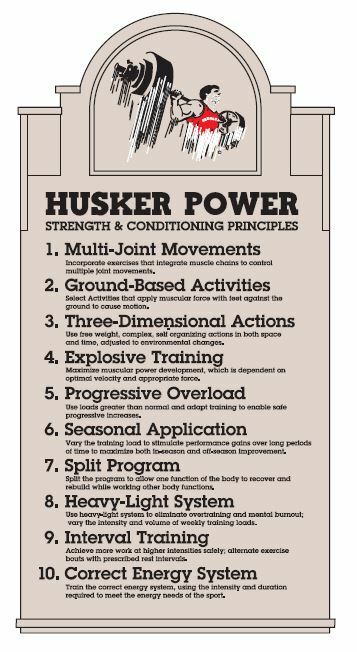 It also helped that we had a great strength staff. That’s another thing, they knew how to get the best out of us, and we were just performing at that level. The crew that was there, Randy Gobel, Bryan Bailey, Mike Arthur and, of course, Boyd, those guys really stuck out to me. 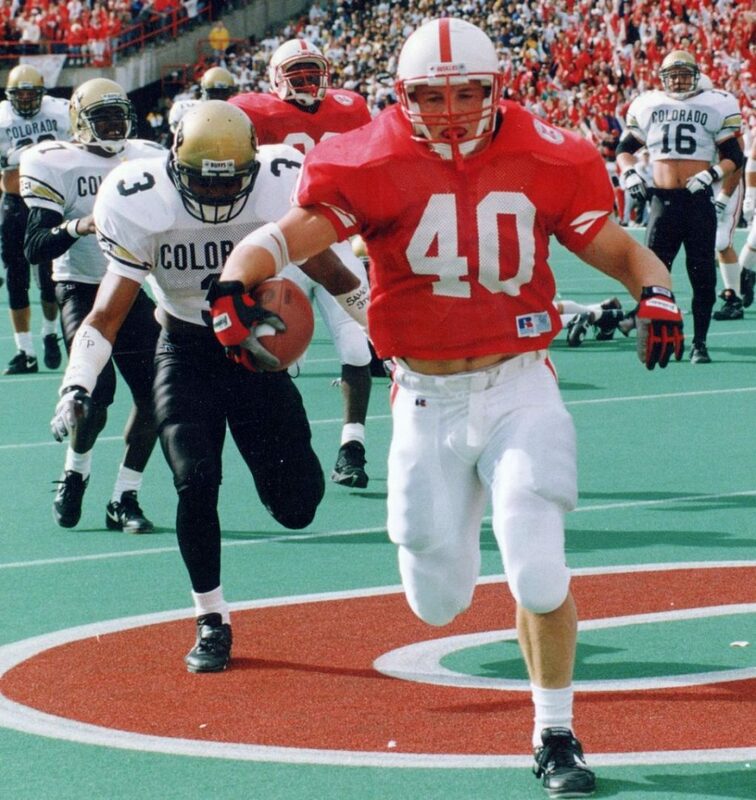 To me, Boyd knew what we needed to do. He just had that personality of, “I’m gonna get the best guys in there to make us the best program.” And he wasn’t out there really coaching us, but he knew how to get the best guys to get us to be the best, and that is what I remember. Q: He shone some headlights down the road and gave you a vision of the plans he had in mind for you? CS: Yes, he basically had a plan. He knew and had confidence in his staff and his program. He knew, “Hey, if you do 225, we’ll have you doing 345 in no time.” He just knew his program was successful and it would work to improve all his players. And I don’t know if he saw the frame I had and, “You’ll get some meat on that body easily. And it’s going to be dense, and when you hit somebody it’s just going to be a thud.” But he had the vision. He had the vision and he knew how to share it. Q: Boyd was always a good salesman, Cory. And he said it in such a confident way that you couldn’t help but believe him, right? Q: Sounds like a typical fullback. (laughs) Can you explain the perverse joy and gratification it gave you to blow somebody up like you guys did? Q: And speaking of ‘again and again and again’, anything about that Miami game stand out to you about those guys? CS: No, not really. I just remember the confidence we had. There was no one that had doubts. It was just the confidence we had in Coach Osborne and each other, and just the way we looked at each other and were like, ”Man, we’re just gonna do this.” No one had their head down and no one looked nervous. It was just, “We’re gonna go do this! Let’s bring that trophy back and let’s not stop!” The confidence was there at halftime. We were down, but we were excited to go out there and play. That’s just the feeling that we had, and how everyone looked in the locker room: “Let’s just go out there and play and win this game.” That’s the one thing that stuck out the most: the look in everyone’s eyes that we were going to finish it. The Unfinished Business. Q: What did the ’94 Orange Bowl do for you? Any recollections of that game? CS: I don’t think anybody really gave us a chance in that game, and we went out there and proved that we could do it. Q: That game gave you guys a lot of confidence in knowing that you could finish it, that you had what it took? CS: Yeah, definitely. It took us to the point that we knew we were going to take it home. Q: Do you think we got hosed in that Florida State game with some calls? Q: And what about the offensive linemen? I’m sure you have some things to say about those guys, being a blocker yourself? CS: Oh definitely. We’re just glorified linemen, I guess. We’re linemen in the backfield. Especially when you go to Detroit your first year, definitely didn’t touch the ball there. Q: And what about your running mates? CS: All my running backs where great guys, there’s no one I could ever say I liked better than the others. We had a group of guys that just worked great together. They supported one another and they made each other accountable and they worked hard. And Lawrence Philips, he was a great guy to block for. Even in practice, he would give you that confidence and tell you ‘good job’ when you made a good play. In practice even. He and I were so in touch with each other. He knew what I was going to do. He had the confidence, “I know what Cory’s going to do here.“ He knew I was gonna do my job. The trust. I remember looking back on Scott Baldwin… I don’t know if anyone has brought up his name. I remember him, he was a stud. I tell you what, I loved watching him run the ball. I remember one time on a kickoff return, he was in the front line and turned around and just lit this guy up. I saw that and I’m like, ‘That’s Nebraska football! That’s what I want to get to! The point where I can hit somebody and knock them backwards like he did!’ He was a good character. I hated to see how everything turned out for him. I would have loved to see how he performed. Q: Who behind the scenes played a huge role for you or the team? CS: The strength staff, definitely. Q: And Coach Osborne, how would you say he affected you as a person and a player? Q: And looking back on it, almost 20 years removed, what do you treasure most? CS: That’s a good question. Just the unity, the chemistry that we had together. Even when we had scout team guys, they just knew their job was to run the card right and simulate what‘s going to happen during the game. And I know there were a few hits out there, game-ready stuff, which is only gonna make us better. You practice like you’re gonna play in the game, and those guys had to sit there and endure the hits. And sometimes they gave them, too, which is also gonna make you better. Q: Any most memorable practice? CS: Every day! Someone was doing something every day in practice. Those fights were always fun, but I tried to avoid them because they were too tiring. And you didn’t want to run stadium steps. That’s true. Q: So if someone gave you a football team to start from scratch, what would you fall back on? CS: Being a coach who’s not two-faced, I guess. A coach that believes in you, a coach that, if you have a beef with him, he says, “Bring it to me.” He’d never downgrade you behind your back. It gets around, players aren’t dummies. They know what’s said in meetings, but when you have a coach who truly believes in you and is gonna fight for you? That’s a man you want to play for. Q: Was that preached, spoken verbally? Or did it just sense it? CS: It was just how the guys in front of you practiced. You did not want to let them down, and you learned from the best, the older guys that were practicing hard. And the guys that weren’t? They usually got weeded out. They didn’t make it their whole college career. They didn’t hang with the guys who wanted to be the best. The guys who won the national championship were the best and they did what they were supposed to do. That’s what it comes down to: do what you’re supposed to do. You‘ve got a job, just do it. Don’t make an excuse or try to fake your way through it. Do what you’re supposed to do. Q: So when you finally left the university and got drafted by Detroit, was there any one thing you missed more than another? CS: Well, not really. My five years? I was ready to move on. My opportunity came and I had a ring, and I wanted to see how I would do at the next level. There were no regrets and it was time to move on to the next level. My time at Nebraska really prepared me for the next twelve. Q: Wow, twelve years in the pros. That’s quite a career, man. CS: Yep. 2006 was my last year. It was hard to hang it up, but your body at the same time was going, “Yeah, you’re not doing what you used to do.” (laughs) That’s kind of the hard part: you want to do it, but your body’s not doing it. Q: Thanks so much, Cory. Any last comments? Q: (laughs) And what about the Kansas State game when Matt Turman started? “Those guys made each other accountable to play like they were going to play in the game on Saturday.’ Practice like you were going to play.’ And that’s what we did, we battled every day in practice.” No eloquency here, as Cory took us behind the scenes and into the minds of the bruisers laying the licks for paths of glory. 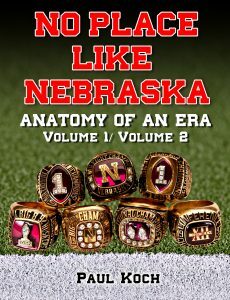 There was a tough-minded, rugged individualism in the Husker fullbacks, and they reveled in it. So did we. 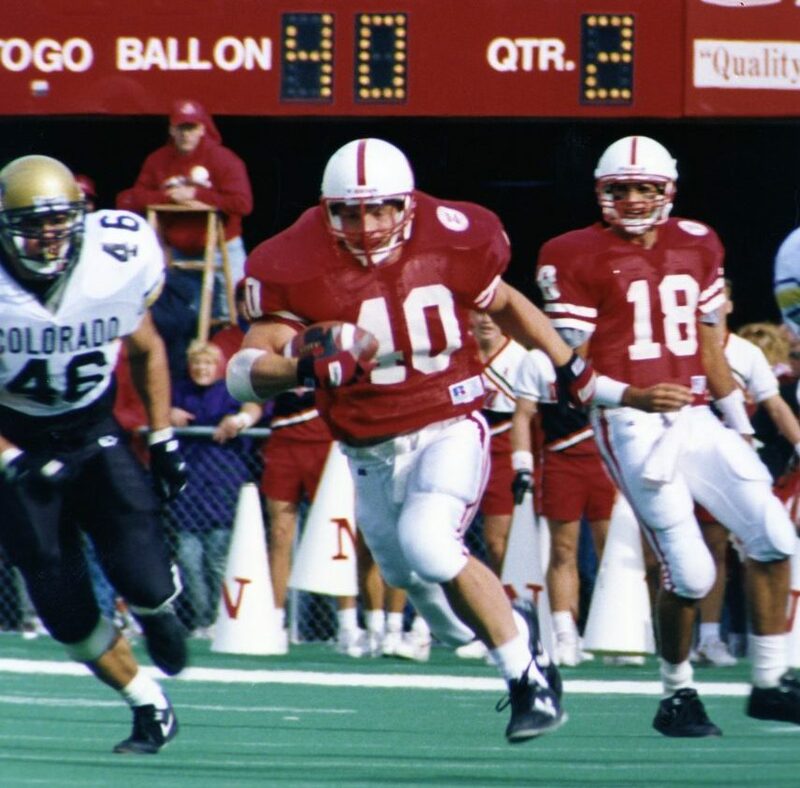 Who among the fanatics of the day didn’t relish the vision of these hybrid behemoths tearing downfield open-throttle on a surprise trap play, ball crushingly cradled, blowing up linebackers and dragging DB’s along like mere piss ants on a pig? “..other guys on the team will be like, ‘Wow! Look at these running backs. We have to keep up with these running backs.’ We don’t have to say anything, it’s just by our actions.” Attitude and good ol’ work ethic hammered into their heads by Frank Solich, they rarely disappointed. As for team concept, it was refreshing to hear Coach Solich’s championing unity by way of his, “When we do score we’re gonna go back and congratulate our offensive linemen, because they’re the ones who got us in there -and the wide receivers and the tight ends- because without them we’re not getting into the end zone.” The ‘Unity, Belief, & Respect’ mantra was lived out in celebration.